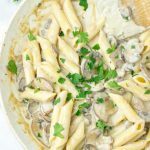 This Marsala Sauce is super easy to make and so versatile. Enjoy it over pasta, rice, quinoa, or with bread as a dipping sauce. No one would believe it is vegan and an amazing addition to your 20 minute meals. Perfect and meant to be for dinner ideas for two, a comfort food for everyone. Heat vegan butter in a pan or pot. Add minced garlic and fry for 3 minutes. Next add sliced mushrooms, marsala wine, coconut milk. Let all simmer on medium heat for 6 minutes more.